What better way to score a silent film about goings-on in medieval France than with medieval music? Even when the film in question, “The Hunchback of Notre Dame,” était fabriqué aux Étas-Unis from a source novel written with no obvious concern for historical fact other than that there was a big church named Notre-Dame in Paris at the time. Hesperus, a powerhouse on the local and national early-music scene, played a medieval soundtrack for the film on Saturday night to close out this year’s Washington Early Music Festival, and their performance — colorful, concentrated, and spontaneous — made it nearly impossible to actually take the movie seriously. The silent-film aesthetic is an acquired one, and Saturday night reminded me that I have not acquired it. The limitiations of the medium lead in Wallace Worsley’s “Hunchback” to exaggeration along every possible axis, from facial expressions to body language to emotions in general. 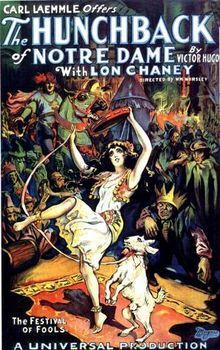 Also, the audiences of the past apparently had a limitless tolerance for watching Lon Chaney as the Hunchback grabbing a rope and ringing a bell. I get that he has great enthusiasm for this task, which is why it could have been filmed from more than one angle, rather than simply replaying the same footage every time. The movie was not as entertaining as this poster, which must have disappointed many people in 1923. From Wikipedia, saver of souls. Such artifice made a striking contrast with the music Chancey, Priscilla Smith, and Rosa Lamoreaux sang and played. They effortlessly conjured serenity, rambunctiousness, tension, officiousness, and even (especially) romance. Only a few times, for fractions of a second, did the music and images not match; normally, the music was so well-chosen to seem an integral part of the scene, like a dancing tune to lead a festival of peasants, or a crusty woodwind proclamation to usher in a nobleperson. The movie gets better when it begins rushing towards its surprisingly intense climax, but here it was difficult to separate the pathos of the Hunchback as he enjoys a glimmer of sympathetic human contact from the pathos generated by this trio of musicians, especially when the texture thinned out and Chancey was left alone to limn a few final notes as the priest (SPOILER ALERT) laid the Hunchback to rest. The trio kept it up for 100 straight minutes, too — no intermissions here. Smith handled 99 percent of the wind-instrument work, with a full set of recorders as well as a shawm, early bagpipe, and crumhorn, and I saw her shaking her right hand out a few times towards the end of the film, trying to keep it from going stiff. Her playing showed no signs of fatigue, and she expertly matched the timbres of her instruments to the onscreen action, varying her sound and approach. Smith even sang soprano in a few two-voice pieces and didn’t sound totally out of her league next to her fellow soprano Lamoreaux, who is pretty much the early-music singin’ queen of the DMV. As noted, the concert closed this year’s Washington Early Music Festival, and during the (enthusiastic) applause, Chancey asked that we direct some of our approbation to Constance Whiteside, the festival’s artistic director and prime mover. Saturday’s concert drew the biggest crowd of the three concerts I attended; fittingly, it took place at St. Mark’s, the church that has been the center of the festival since it began in 2004. While Hesperus had a unique contribution, their concert sat squarely in the larger WEMF tradition of presenting little-known music with enthusiastic, committed performers at reasonable prices. The WEMF is a summertime oasis from the fall-to-summer run of the standard rep played by the standard people. I hope it keeps going strong in the years to come. Other People’s Perspectives: Anne Midgette. I swear I was not stalking Anne this past weekend. On Thursday, the National Orchestral Institute‘s New Lights chamber concert started before the music itself did. Just as the student-musicians on stage had finished tuning, other young folk (later revealed to be fellow NOIers) streamed into the Gildenhorn Recital Hall, sorting themselves into pairs that each clapped in a different rhythm and encouraged the audience to join in. The program revealed that these rhythms came from Bach’s second Brandenburg Concerto, the first movement of which we were about to hear, but even with foreknowledge the clapping struck a spark: Yes, this is really happening at a classical music concert. The New Lights concerts have always sought to surprise, with modern repertoire played with committment and skill and presented in ways that are unusual but perhaps shouldn’t be. On Thursday, we heard music without pause for three-quarters of an hour, textures and idioms varied widely around a focal point, Paul Moravec‘s Brandenburg Gate, a chamber concerto commissioned by the Orpheus Chamber Orchestra as a response to the very same Brandenburg No. 2 of Johann Sebastian. 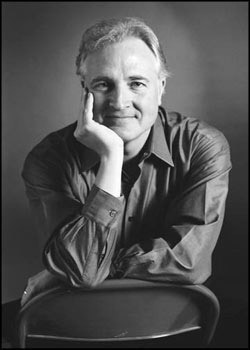 Paul Moravec watched the whole concert from a box and said at the end that this concert was “one of the coolest things I’ve ever been involved in.” Photo from his website. From a vigorous performance of the Baroque selection, the concert slid — literally, via glissando — into a movement from a John Cage string quartet, played by students in the upstairs box seats, with the lights dimmed. Cage’s strategically noncommittal scrapes, extra-tentative here, yielded to the similarly spare but more expressive “Spiegel im Spiegel” (“Mirror in Mirror”) of Arvo Pärt, where those musicians still on the stage traded off with those in the boxes. A piano in a box close to the stage played relentless triadic arpeggios in the Pärtian bell-like style and served as a kind of fulcrum between the two groups. The cloud of sound started breaking when the NOIers began playing motives from the Moravec, eventually launching into its onrushing, clarifying energy and relentless minor seconds (in the form of “B-A-C-H”). The ripenio group of flute Mark Huskey, clarinet Jen Augello, trumpet Anthony DiMauro, and violin Kenneth Liao commanded attention at the center, playing with assurance and brio. The orchestra played a dense score with remarkably unanimity of expression, earning post-concert plaudits from the composer himself. The Cage and Pärt performances didn’t quite get to that level, and while the program traced a clear path from piece to piece, it remains unclear to me exactly what the non-Bach works actually had to do with the Moravec. (Also still baffling is the program’s description of the substitution of a vibraphone for the trumpet in the Bach as “clever,” when clearly a trumpet was available and when the orchestra frequently had to drop its volume so the vibraphone could be, you know, heard. In general, another read-through on the program would have been a good idea.) But the format of the program kept the sense of adventure alive throughout — never a slack moment in which quotidian thoughts could intrude — and the modest length left me hungry for more. The University of Maryland brings all these young people to the NOI because it’s just fun to have talented youths hanging out with each other, but also to help them shape their careers, meaning that they may just represent the Future of Music. If it means more concerts where musicians actively engage the audience, think of novel ways to present music, and tread boldly into modern repertoire with instant appeal, bring on the future. Other People’s Perspectives: Anne Midgette. (No, the concert did not take place at Strathmore. Blasted headline writers. I still cringe when remembering this doozy.) Updated to add: Charles T. Downey. You are currently browsing the DMV Classical weblog archives for July 2012.